With storage, bandwidth, and the quality of network connections and solutions getting better, CDs and DVDs are being shared — hopefully legally — and backed up more frequently. These often take the form of *.iso, *.bin, *img, *.udf and other files, freeing you from having to carry discs around. There are programs such as Alcohol 52% or 120% (which also enables you to create backups) and the unsupported, Microsoft-released “Virtual CD-ROM Control Panel for Windows XP”, which enable you to “mount” the backup files as virtual drives. This is useful if you don’t have a CD / DVD drive on your computer or you simply don’t want to wastefully burn a disc. 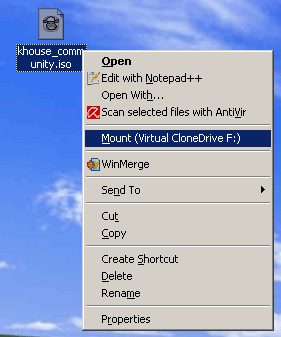 My favourite such program for Windows is Virtual CloneDrive. With the sole purpose of emulating a CD / DVD drive, Virtual CloneDrive is efficient and simple to use. Its options are straightforward, it’s a lightweight program, and it’s free. Once you’ve mounted the disc image, it will appear like any other actual drive on your computer, as if a disc was inserted into that drive.